STEP ONE Lower spare tire for access to frame cross-member panel with winch mechanism mounted above. 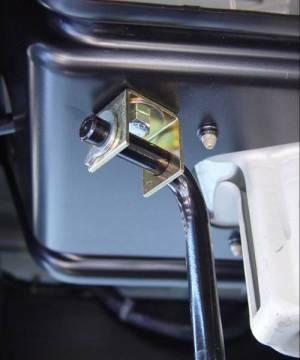 Locate the 5/8" diameter hole stamped in the panel several inches rearward of the winch mounting bolt as shown in picture at left. 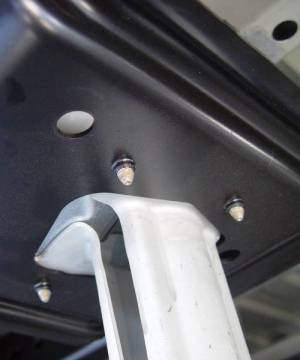 Install the U-shaped mounting bracket and position as shown in picture at right using the provided 3/8" bolt, lock nut and flat washers. STEP TWO Install the lock bar through the holes in both legs of the U-bracket, with the grooved end toward the rear corner of the right side frame rail. Place the crimp-ring retainer in the groove and crimp closed with pliers. STEP THREE Raise spare tire while guiding the lower end of lock bar through lug hole least obstructed by the winch cable retaining plate in the center of the wheel. The lock bar must remain vertical as the spare tire is raised to the full up/stored position.